The 2017 Eddy County Fair is officially open to the public. 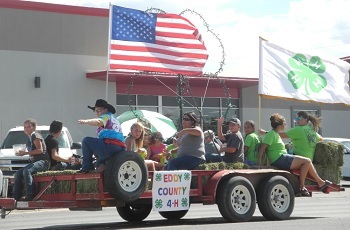 This afternoon’s fair parade kicked off the event, as trailers, trucks and tractors, such as the Eddy County 4-H entry pictured above, made their way down Main Street. The exhibit buildings will be open to the public until 9 p.m. today, with the dairy heifer show set to begin at 7 p.m. in the livestock show ring. The rabbit show will open Tuesday’s events, with exhibit buildings open from 10 a.m. – 9 p.m. Check each day’s edition of the Daily Press for updates on the schedule of events for that evening and the next morning, and enjoy the fair!